For countermeasures against counterfeit products, starting June 1 we shall attach the Kumanofude® Brand seal to the Chikuhodo brand (products with our logo) product packages. ※Except for the screw brushes, brush and comb, and tip. 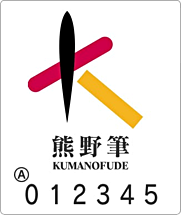 The Kumanofude® brand seal is a seal that certifies that it is a Kumano brush. The head is made in Kumano-machi, and only finished products can use the Kumanofude® brand seal. The brand seal is issued by the Kumanofude Cooperative to the union affiliation contractors, and a serial number is indicated for each one respectively. Please refer to the Kumanofude Cooperative HP for further details.